It was a lineup not dissimilar to one of Jurgen Klopp’s post right-back experiments, not in shape or style, but in the questions it posed pre-match. Klopp’s most recent alterations saw Jordan Henderson used in a position which has become a problem since an injury to Trent Alexander-Arnold but, unlike Klopp, who is having to cope with injuries to his two best right-sided defenders — Alexander-Arnold and Joe Gomez — the Manchester City manager only really has one problem area in his squad — left-back. Right-back Danilo has been filling the position in recent weeks, impressing most of the time but struggling in the loss at Newcastle. Back home, City faced an Arsenal side with potential, with Pierre Emerick-Aubameyang, and with Alexandre Lacazette. But Unai Emery’s problems also lie in defence and are worse than those faced by Guardiola and Klopp. Not an ideal situation to be in when coming up against the array of attacking weapons in the defending champions… erm… arsenal. It appeared that Guardiola had solved his left back problem by simply not using one. On paper the team shape looked like it could be a back three with Kyle Walker on the right, Aymeric Laporte on the left, and Nicolas Otamendi central. But then who would play left wing-back? 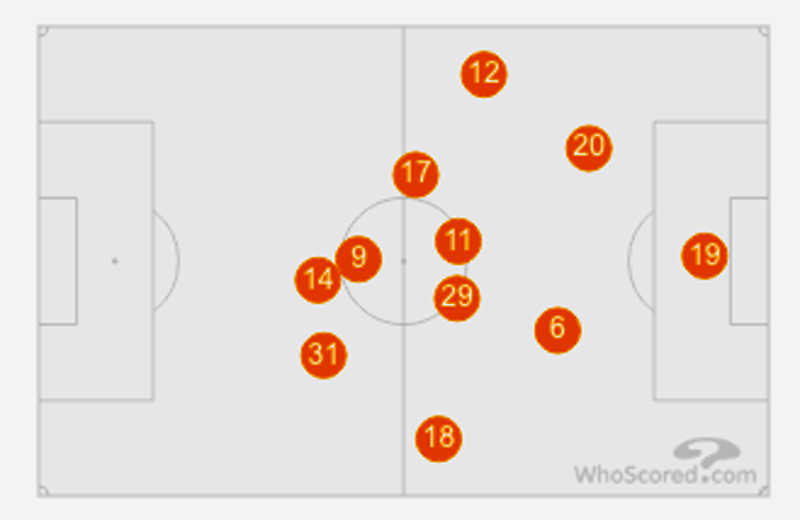 The answer was no one, as the Catalan improvised by sticking Laporte on the left, Walker on the right, and Fernandinho alongside both Otamendi and Ilkay Gundogan, depending on which side had the ball. 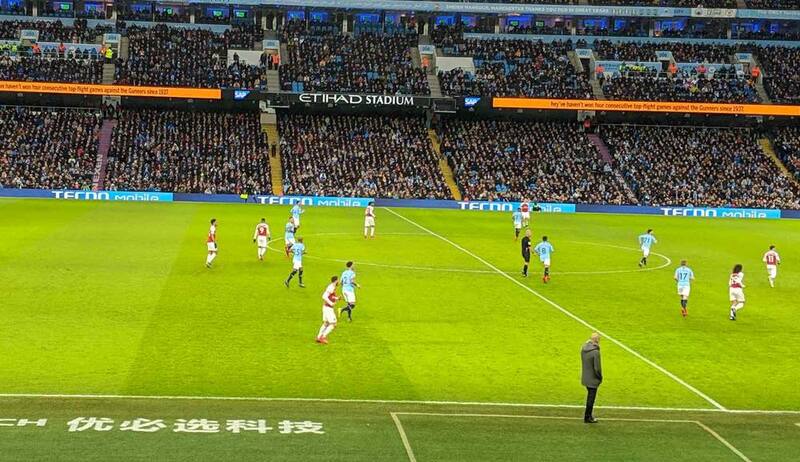 When defending City lined up in the 4-3-3, or 4-1-2-3 which has become Guardiola’s go-to formation at the Etihad. Fernandinho slotted in at centre-back, but everything else was fairly usual so there was minimum disruption to their defensive shape. Few extra instructions will have been needed beyond those given to the Brazilian. In the screenshots below Fernandinho is himself explaining City’s shape in possession, which was something like 3-2-5. He moved into midfield before motioning to Walker to drop behind him, then pushing Kevin De Bruyne towards the attack. And here is the new Typical City, dropping into the 4-3-3 when defending, and Fernandinho is about to move back into midfield as Gundogan wins the ball. 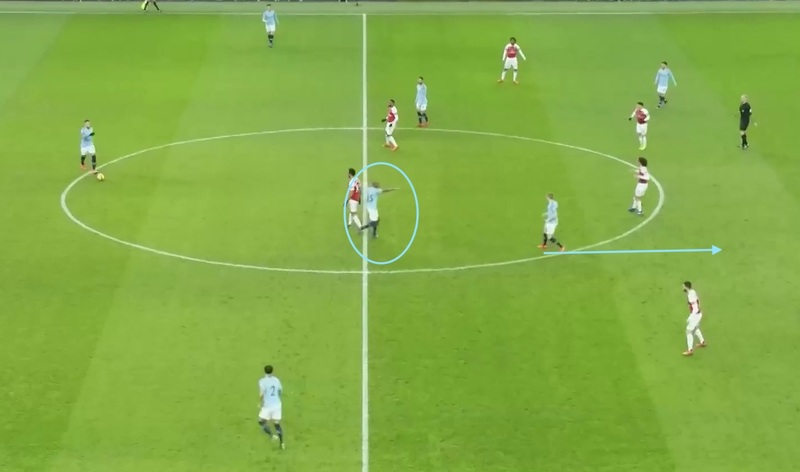 This had a knock-on effect on Arsenal, who appeared to be using Matteo Guendouzi to try to stifle De Bruyne. The Belgian’s more advanced role with the ball, afforded to him thanks to the double pivot behind which would usually consist of a solitary defensive midfielder, meant the generally impressive Guendouzi was often in the Arsenal back line alongside the centre backs. 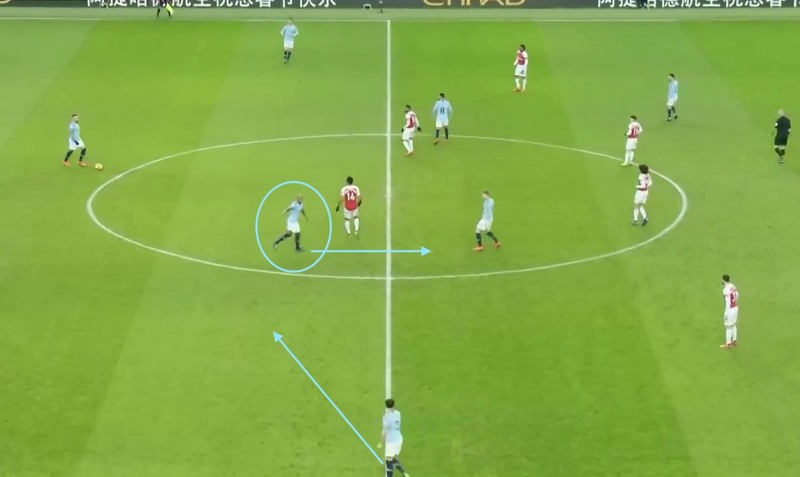 Shkodran Mustafi and Laurent Koscielny couldn’t keep track of Sergio Aguero, whose hat-trick came through clever movement rather than sensational shooting or wonder-strikes. The Argentine scored within the first minute, and Mustafi was lucky not to give away a penalty for an obstruction on Aguero just minutes later. They couldn’t handle him, but this was partly because they had to keep an eye on the runs of De Bruyne and David Silva from midfield, and that’s before you get to the differing wide threats of Raheem Sterling and Bernardo. Sterling especially had plenty of joy down the left up against Stephan Lichtsteiner. Leroy Sane sat on the bench throughout in what was a demonstration of the club’s strength in depth, the German no doubt wishing he was the one given the chance to go up against the 35-year-old. Sterling assisted two of Aguero’s goals, and though the creation of the space was different for each — a chip from Gundogan for the first, and tricky feet from Sterling for the second — the final execution and outcome was the same. “City scores that goal so often that it has become its default setting,” writes the New York Times’ Rory Smith. 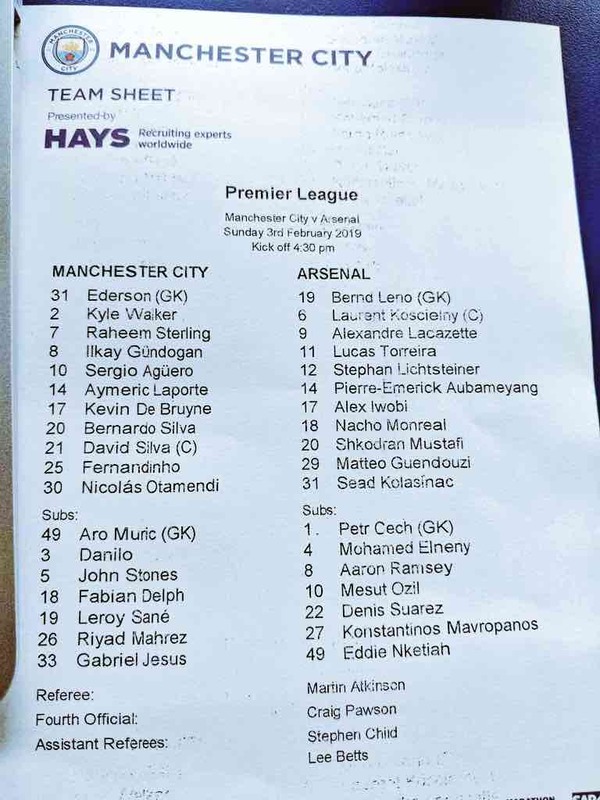 For all of City’s tactical quirks, perhaps the most unusual use of a player in this game was Arsenal’s Sead Kolasinac. The Bosnian who is usually a left back, or very occasionally a centre back, was operating in an attacking midfield position on the left, even drifting into the centre at times. Arsenal’s average positions are shown below. Kolasinac is no. 31. The second half looked easy for City, and Emery admitted as much in his post-match press conference. 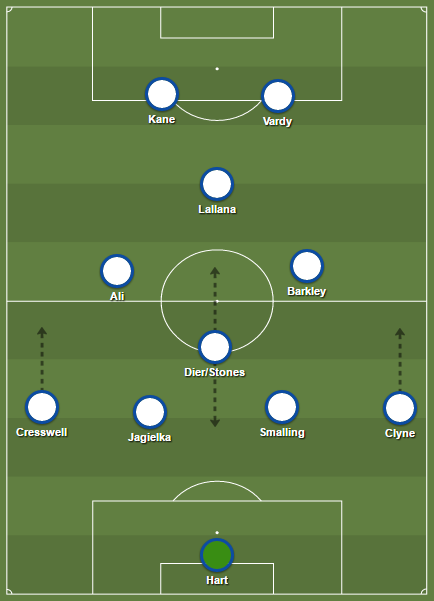 It was supposed to be one of the trickier tests for the champions in their quest to retain their title, but a simple yet effective tactical tweak helped them coast to victory.